Anna Maria Island is known for its piers. It has three main piers that stretch out over the Gulf of Mexico waters, and each has something different to offer. Anna Maria Island piers are perfect places to enjoy a cold dessert, watch the sun go down, eat tasty seafood, or even do some pier fishing. Here is a brief introduction to the three Anna Maria Island piers to visit while on vacation. The island’s historic City Pier is the longest on the island at 700 feet, a long finger dipping into the turquoise gulf waters. The City Pier has been victim to many tropical storms over the years, and was badly damaged by Irma in 2017. The pier is currently being rebuilt from the last major onslaught of weather, and is close to pedestrians for a period of time. When it reopens, expect a lively hub of activity, especially during high season. Both visitors and locals love to visit the City Pier to watch the sky burst with color over the bay – on clear days, you can even see the Sunshine Skyway Bridge that connects St. Petersburg to the north with Bradenton and Sarasota to the south. You’ll find the Anna Maria City Pier at 100 S. Bay Blvd., just south of Bayfront Park. Head a few blocks north on the same side of the island and you’ll find the Rod and Reel Pier, a 350-foot wharf where you can eat great seafood and go pier fishing. The Rod and Reel Pier is also the name of the restaurant that sits at the end of the pier on top of the blue water. This two-story restaurant is newly renovated, but still retains the charm and flavors of Old Florida. This eatery serves only the finest local fish and seafood – a mix of traditional dishes, local favorites, and famous Rod and Reel specials. The fried grouper, seafood omelette, and crispy fries are just a few of the menu favorites. Pier fishing is popular activity on this wharf, particularly among young kids. Rent a rod or bring your own, and drop the line into the blue waters below. Keep your eyes peeled for playful dolphins and slow-moving manatees in the water below. They are curious, social animals that often pay pier-goers a visit. 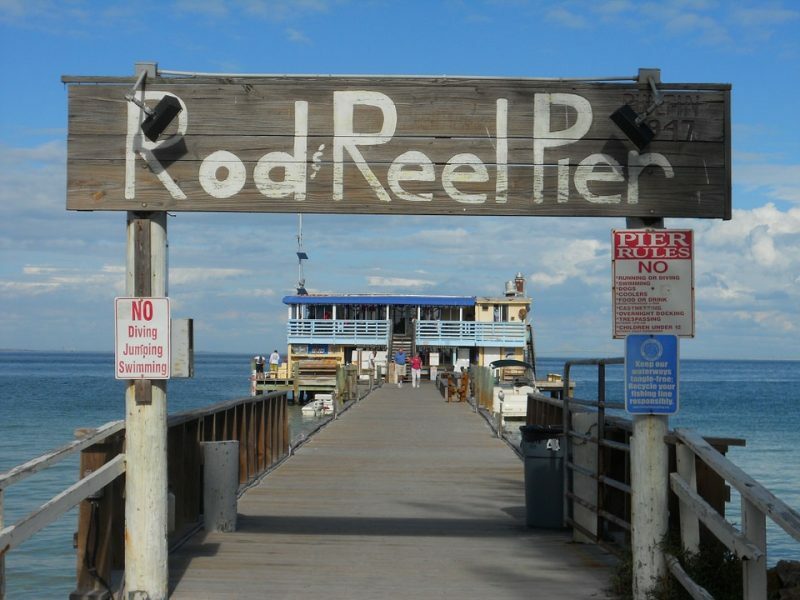 The Rod and Reel Pier is located in the city of Anna Maria at the northern tip of the island at 875 N. Shore Dr. Historic Bridge Street is Anna Maria Island’s bustling shopping and dining area – all at the foot of the Bridge Street Pier. The pier was once part of the original – and only – bridge onto Anna Maria Island before the island was developed and other access roads were built. The pier is located south of the Cortez Bridge which offers a southern access to the island from the mainland village of Cortez. It is an historic pier on the bay side of the island, with white-painted railings, a clock tower, and a covered area with benches. Grab a cone and watch the sailboats bob in the harbor beside the Bridge Street Pier. Keep an eye out for dolphins, manatees, and pelicans catching their next meal, while the kids enjoy some catch-and-release pier fishing. Then, head to one of Bridge Street’s restaurants for a scrumptious meal. Find the pier at 200 Bridge St., in Bradenton Beach, a quick trolley ride from many local vacation rentals. The perfect place to take an evening stroll, the Anna Maria Island piers have become gathering spots for vacationers and locals. You can read more about AMI’s activities and attractions on our website. While you’re at it, browse our list of luxury rental properties to find your next vacation paradise.